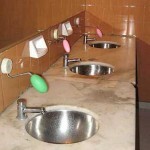 This public hygiene oxymoron is pictured to the left — they are the green and pink egg-shaped items suspended over the sinks on metal bars. 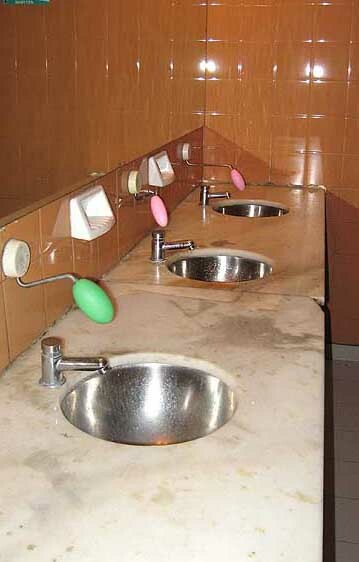 The first time that we encountered these in a public restroom, none of us could figure out what they were (it’s as if the girls and I mentally erased their existence) and we proceeded to search high and low for the soap. I’m not sure upon whom it finally dawned that we were supposed to rub our hands on the Easter egg hanging over the sink! This entry was posted on Wednesday, December 31st, 2008 at 9:43 pm. You can follow any responses to this entry through the RSS 2.0 feed. You can skip to the end and leave a response. Pinging is currently not allowed. It took me a few minutes to recognize the hanging balls of soap as well – it’s a fantastic idea, although I’m not that keen on sharing soap with others. I only spent 3 weeks in BA but loved it. Really enjoy your blog, thanks! Sheldon! Mil danke for reading and commenting. Checked out your blog — growing up in Singapore, moving to Vancouver, traveling to Buenos Aires…you get around! !